Whether it’s the depths of winter or the height of summer, it always seems like it’s a perfect time for nabe, a variety of Japanese hot pot dishes that is generally eaten communally from a pot placed on a portable burner situated at the center of the dining table. Warm, filling, and social, nabe is essentially a one pot dish where an assortment of vegetables and meats are cooked in a flavored broth. It’s perfect for the cold winter months and will warm you up from head to toe! While most might be familiar with the more strongly flavored sukiyaki (also a nabe dish), in today’s post, we’ll be taking a look at chicken nabe (tori nabe, in Japanese), which boasts a much simpler taste, using fewer sauces, and instead relying on the freshness of the ingredients to provide most of the flavor. To complement this simple nabe dish, ponzu or soy sauce are generally used as a light dipping sauce. 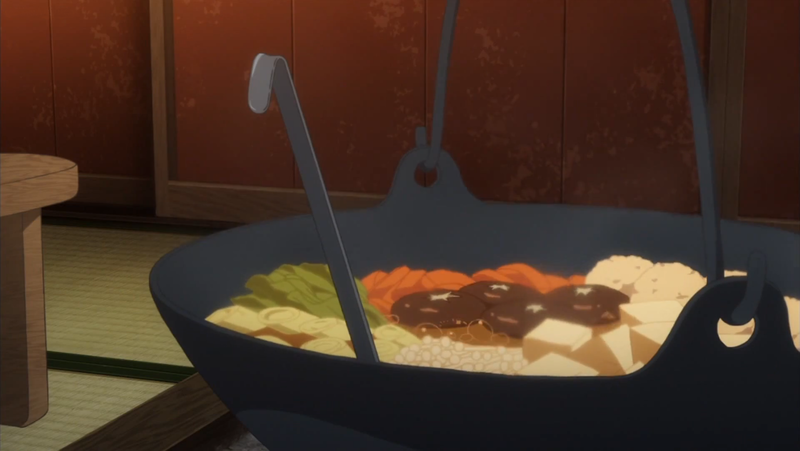 In anime, chicken nabe is not only served in the winter, but also the summer – for reasons I’m not so sure of…. 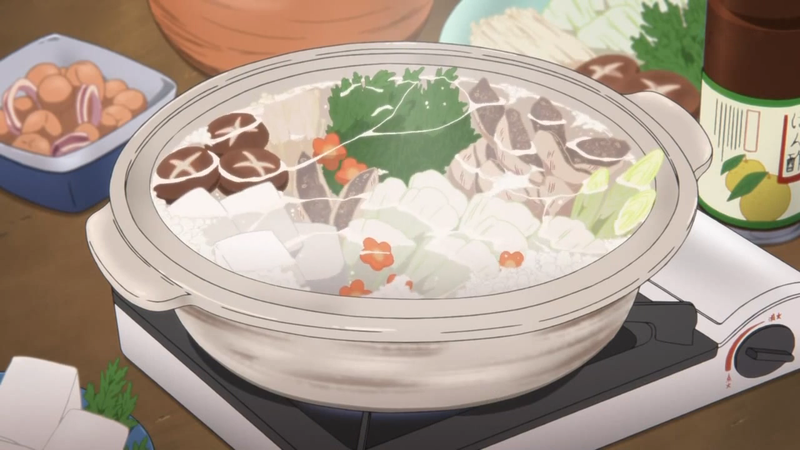 because, summer is already hot, so why are so many anime characters eating hot nabe? At any rate, whatever season you decide to eat chicken nabe in, after you’re finished, you’ll feel as hot as summer, through and through. For a glimpse of chicken nabe in anime, check out Glasslip, Nagi no Asukara, and Tamako Market for a little inspiration! Chicken nabe is pretty simple to make, though it does require a bit of prep work and some specific equipment… namely a portable burner and a low rimmed pot. While nabe is generally cooked in a clay or cast iron pot, any low rimmed pot that is only about 4 inches deep will work well too. It’s important to not use a very deep pot because the tall rim will obstruct your view of the pot’s contents while sitting at the table, making reaching for the cooked food difficult. Because chicken nabe is a “one pot dish”, where all the vegetables and meat you need are included in the meal, there’s no need to make side dishes or anything to go along with the nabe, except for a little rice, if desired! This makes nabe a simple to make meal that is really perfect for a family or group dinner. 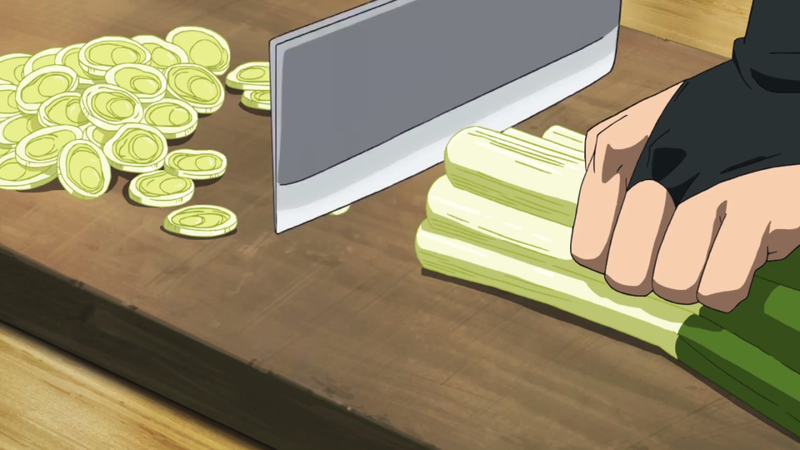 That said, since everything is cooked at the table, it’s important to prepare all of your ingredients before hand so that you’re not scrambling to cook and cut vegetables while trying to enjoy your meal. If you cook this at the table, please also be careful that you don’t inadvertently contaminate your cooked food with the raw meat. A good way to ensure safety is to have two separate pairs of cooking utensils (I like to use chopsticks or tongs): one pair that can be used to handle the raw meat and cook the ingredients in the pot, and another pair for eating with. 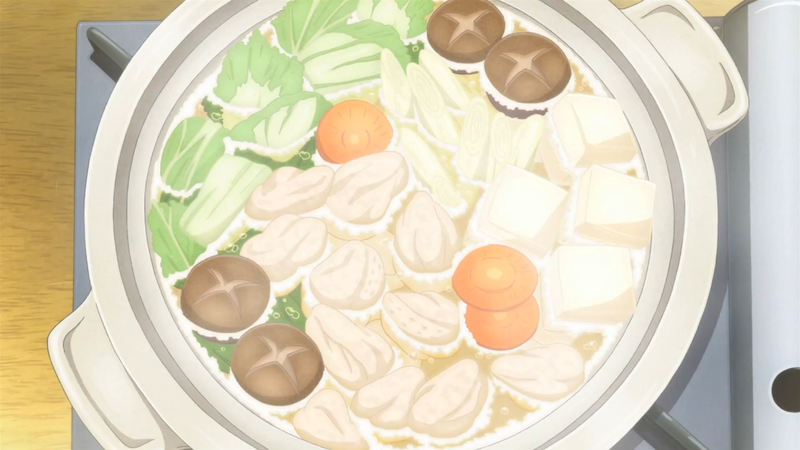 And one last thing to note: this recipe can be scaled up or down to accommodate any number of people, but since everyone will be reaching into the same pot to retrieve food, you’re limited by the size of your pot, the size of your table, and the number of people that could comfortably share one nabe pot. I think 6 (maybe even 8?) people could easily share one nabe pot, but any more than that and you may run into conflicts over how quickly the food cooks. In cases of parties of 10 or more people, two pots might work better. Use your best judgement! Japanese green onions, (also called “negi” in Japanese) is almost like a green onion crossed with a leek, being much longer and thicker than a typical green onion. Japanese green onions can be found in some Asian grocery stores, but rarely in Western stores. If you cannot find it, just use regular green onions (or, even leeks if you like) instead! Chrysanthemum greens (called shungiku in Japanese) is a very fragrant and slightly bitter leafy green vegetable. It can be found in some Asian grocery stores, but I have yet to see it in Western stores. Chrysanthemum greens can be substituted for any leafy green such as watercress, spinach, bok choy, or Chinese broccoli. Fresh shiitake mushrooms are a great addition to chicken nabe, especially since the mushrooms tend to soak up the flavorful broth and dipping sauces wonderfully. Shiitake mushrooms are commonly found in many regular grocery stores. Only use fresh shiitake, and not dried, since the dried mushrooms have a much stronger and very different flavor than fresh ones, and will generally be a bit chewy. And, if you really can’t find this type of mushroom, you can also use a portobello in a pinch. I think oyster mushrooms or straw mushrooms would also taste good… However, white button mushrooms should not be used as a substitute. Enoki mushrooms can be found in most Asian grocery stores, usually in small packages. These white mushrooms have a long, thin stem and a small cap, and are typically clumped together at the bottom of their stems. To use, simply cut off the dried bottoms and then separate the mushrooms into more manageable clumps. Udon is typically added to the empty nabe pot to finish the meal off once everyone has had their fill of meat and vegetables. This thick noodle can be found in many Asian grocery stores, either fresh or frozen, and are generally precooked so that they only have to be boiled for a short while before being eaten. If you can’t find udon in your area, you can always try making your own by using this recipe for homemade udon! If you make your own udon, make sure to precook the noodles first (most store bought udon is already precooked), so that the nabe broth doesn’t become starchy. Note: serving size can be scaled up or down, and tailored to your tastes, all depending on how much meat and vegetables are added to the pot. 1. Fill a low rimmed pot with about 2 inches of dashi stock. Add the konbu and let sit at room temperature for at least an hour, or up to 8 hours or overnight. Chicken: Rinse, pat dry, and remove excess fat. Cut into 1.5 inch pieces. Napa cabbage: Separate the leaves, wash in cold water, and slice crosswise into 1 inch pieces. Chrysanthemum greens (or any leafy greens): Wash and cut into 2 inch pieces. Japanese green onions: Wash and slice the white parts at a diagonal into 1/4 inch pieces. Shiitake mushrooms: Wipe clean with a damp paper towel. Cut off the tough or woody ends of the stems, if necessary. Cut an X pattern at the center of the mushroom cap, if desired (this step is pure aesthetic). If using a portobello mushroom, cut into 1/4 inch slices. Enoki mushrooms: Cut off the dried bottom portion and separate mushrooms into several small clumps. Tofu: Drain of any liquid and cut into 1.5 inch cubes. 3. Bring the pot of dashi stock and konbu to a boil on a portable burner placed at the center of the dining table. Add a portion of the chicken, cabbage, green onions, and tofu to the pot, keeping the items separated from each other and grouped together with their respective types. Return pot to a simmer, turning the ingredients every so often to ensure the uppermost items are cooked evenly. 4. Add leafy greens and mushrooms, and continue cooking until the chicken is cooked through and the napa cabbage is soft, about 5 – 8 minutes. Serve by removing desired items from the pot and placing into a small bowl. Pour ponzu or soy sauce over the items (or dip items individually in sauce). When the majority of the items in the pot have been removed, another serving of vegetables and meat can be added. Place the ingredients in groups in the broth and simmer as before until cooked through. Add udon to the empty pot at the end of the meal, cooking the noodles as per the instructions on the package. In order to avoid over cooking ingredients and to make way for the next serving of food to be cooked, clear the pan by simply removing the remaining items and distributing them to the bowls. The food will have time to cool off a bit while resting in the bowl, and everyone can still have something to eat while the next portion of meat and vegetables cook. If there is not enough simmering liquid in the pot, add a little hot water.